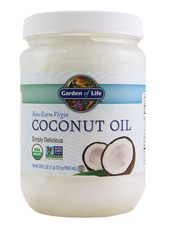 Product Description: Raw Organic coconuts are among the world's most nutritious foods, and we've carefully cold-pressed them (never bleaching, refining, deodorizing or hydrongenating) locking oil in all of the flavor and nutrition. Our Raw Organic Extra Virgin Coconut Oil is naturally rich in Medium Chain Triglycerides (MCTs) supplying natural energy to your body. Additional Info: If stored below 76 degrees F oil will solidify. If exposed to temperatures above 76 degrees F oil will liquefy. Does not require refrigeration. Certified Organic by QAI. Made in Phillipines. Made in the Phillipines. Bottled in Canada. Suggested Use: Use our Raw Extra Virgin Coconut Oil by the spoonful to add creamy richness to smoothies or salad dressings. It's great as a medium-heat sauteing oil or in baking. Use as part of your organic body care program. No refrigeration required. Use in cooking, sauteing, baking or in smoothies. Can be used in place of other oils including butter.